In case you haven't already worked it out I am in the Big Apple....New York City! I finally arrived at my hostel close to 10pm last night after a 3 hour flight delay due to bad weather in NYC, and as you can see from some of my pictures, the weather hasn't improved much. New York is my home for the next 5 days, along with the other 8.5 million people who live in the city that never sleeps. It is home to so many internationally popular buildings that my itinerary for the next 5 days is jam-packed. I'm just crossing my fingers that the weather comes to my party! Be sure to follow me on Instagram and Facebook for real time updates and to follow my journey. 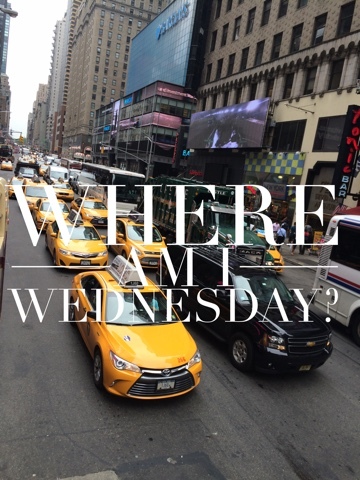 And be sure to pop back next Wednesday to see where I am! Linking up with Agent Mystery Case, My Little Drummer Boys, My Brown Paper Packages and A Brit and a Southerner.